Scores of pastors under the banner of Gospel Ministers Association, GMA, have petitioned God through prayers on the multiple problems facing Cameroon. But the Men of God maintain that only he (God) alone can decide on whether or not schools will resume in September and not men. Meeting at the esplanade of the Kumba City Council Grandstand on Monday, August 7, the clerics staged an Ecumenical Service during which a series of prayers were made to God on behalf of the nation. With inspirations from several Biblical scriptures, the Men of God in a two hours prayer session handled issues affecting the nation. The clergy prayed for peace, repentance, revival of the economy, termination of Boko Haram, school resumption and general prosperity. 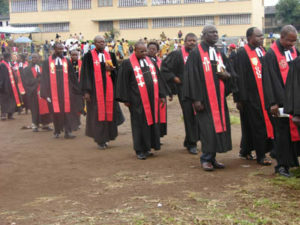 The court cases against the Anglophone Church leaders were also committed in the hands of God. In one of the exhortations, the ministers of God observed that, if those in position of authority are ruling the nation in error, the church should take the blame because it has failed in its sacerdotal assignment of praying. In another prayer point, the GMA members begged God to seize the academic year from the hands of politicians and other people of ill omen so that it will not be disrupted. Speaking to The Post, Archbishop Godfred Tarh Anyere, of the New Day Kingdom Synod said “we are asking the nation’s leaders to seek the face of God for things to be better for this country. If we do not seek the face of God, it will be difficult for the nation to have the peace it desires… because if we go back to the bible in the book of second chronicles 7:14, it says if a people who are called by God will turn away from their sinful past and cry up to God.. God will forgive them… God will cleanse them… God will bless them… and God will heal their land. So this land can only be cleansed if people turn to God. On the situation of Church leaders in Court, he said, prayers have been said for them since they were sued. “We are not biased and we have prayed for those church leaders from day one… when they were taken to court and we know it can go nowhere because you cannot take God to court… The church leaders represent God in this country,” Anyere stated. Commenting on the situation of school resumption, the Man of God said the prayers have been made and only God can decide whether schools will resume or not. He said no one wants children to return to school more than their parents. Anyere charged the powers that be to promote a just society for all Cameroonians to live as one. Prophet Philip Etta, President of GMA told The Post that prayer have a lot to do when it comes to conflict management, reason why, the Ecumenical Service was organised. To those spearheading the protest, the man of God said “every hurt child has a reason to cry and a father also has a reason to listen to a crying baby. We are calling for calm on both sides whether measures have been taken or not… there has to be first of all calm before there would be dialogue… if there is no calm there can be no solution, you cannot dialogue with guns, we continue to pray for the nation and in every session we sit, we pray and hope that things change for the better,” Etta stated.